My grandparents and their four sons (one of whom was my dad John) lived in Atheldene Road in Wandsworth at the start of WW1. My grandfather Thomas had been a Royal Marine for 12 years, leaving in 1905 to marry Emily Potter. He worked at Nine Elms and Clapham Junction and had just been promoted to a signal man in 1914, his pay increasing to 26/- a week. Things were on the up. However, as a member of the Royal Marine Reserve Brigade, Thomas was quickly called up and sent to France. He took part in the defence of Antwerp during which, he went out on patrol and was shot in the head. He survived and was brought back to England but died on his 40th birthday on October 20th 1914. Tragically, Thomas would never have been called up had he not been in the reserve; he was too old. His widow, Emily was born on February 2nd 1877 in Lambeth, London. She was born into a poor family and her father’s occupation was described variously as general labourer, green grocer, costermonger and hawker of fish at different points in time. Shortly after Thomas had died, Emily received a letter that Thomas had written whilst in hospital. Receiving the letter must have been particularly heartbreaking as Thomas had written that he believed he would soon be transferred nearer to home. I also have a copy of the letter of condolence written by his CO, surely the first of many he would go on to write. He had served with Thomas before the war, knew him well and said “he was the finest of many good men, was brave under fire and generally played the game” – this is touching – Thomas was indeed a keen sportsman and this comment is so very “Edwardian” and of its time. Thomas’s funeral was covered by the local papers as the deaths of soldiers were still deemed newsworthy at this early stage of the war and he had a full military funeral. See here for an extract of his obituary. The family were so poor that when I tried to find his grave in the 1990s, I discovered that there was no headstone. I contacted the Commonwealth War Grave Commission, who arranged for a headstone to be made and erected on his grave – I was so thrilled that he at last had his own memorial – he is remembered on a memorial at Waterloo Station along with other colleagues who worked for the same rail company and who also perished in the war. The year following Thomas’s death must have been a terrible struggle. On the first anniversary of his death – 20 October 1915, 100 years ago, Emily was looking after their four sons, the eldest of whom was 8, the youngest 5. 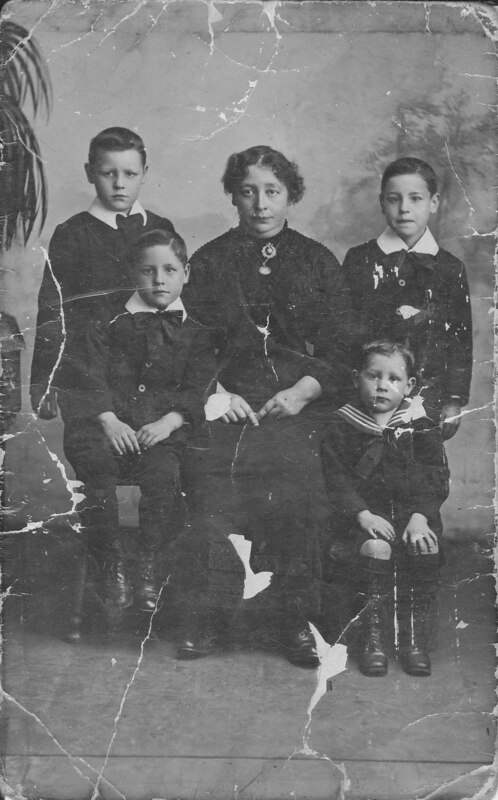 She took a job in a laundry and set about raising her sons as a single mother, a daunting prospect for any woman in 1914 with no welfare state or National Health Service for support. She would work in the laundry by day and briefly return home to feed her boys before going back out to scrub floors by night. Emily’s frantic schedule meant that she would often put the boys to bed in their school uniforms as she would not be there to prepare them for school. I find the thought of her day to day struggles unutterably sad. Thomas was a really loving husband and father – you can see this in his postcards and letters to his wife and boys; he had been on the way up in his employment with the railway and Emily had such a wonderful future to look forward with him. He had even bought the boys musical instruments to play as he wanted them to get as much culture as possible. All that changed. The instruments were sold. The lads had to work as well when possible – though one son – James –got a scholarship to Emmanuel College in London. How did she manage it?! The four boys were devoted and looked after her when they were young men. They all played a lot of sport, read and got on as best they could. They were all a credit to her, having families, doing well in relatively low paid, but secure jobs – sadly James died at El Alamein, a fact that was kept from Emily just before she died. 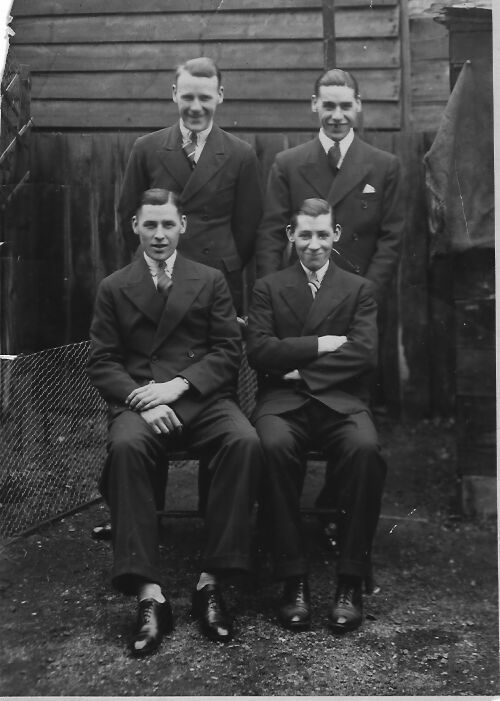 The four boys as young men – happy and well! There were no medals or citations for Emily but she was a truly wonderful, remarkable, uneducated but lovely lady. Thank you to the grandmother I never met, but whose hard work helped me become who I am today and of whom I am indescribably proud. Battersea Borough Council met on 23rd June 1915, and like their neighbours in Wandsworth were starting to record members of staff who had been killed in action. The death of Benjamin Henry Bourne, a third class clerk in the Accountant’s Department, on 26 May was reported, he had been in France with the 23rd County of London regiment. He was 21, the son of Benjamin and Caroline Bourne and from Hillier Road, Wandsworth Common. This was not the only staff related matter which the Council had to consider. As well as their regular meeting they held a special meeting, where the agenda related to pay for members of staff who joined the Forces. In September the Council had agreed to pay staff the difference between their Forces wage and their Council one, to ensure that the men were not out of pocket by joining up. About 102 of the Council’s staff were now receiving these payments, and the meeting’s eventual decision was that only those who obtained permission to join the Forces should receive it. A proposed amendment that permission should be refused to those involved in munitions work was voted against. Recruitment for the new planned Battersea Battalion was also raised at the meeting, two councillors were already members of it and came to the meeting in uniform – according to the South Western Star they “were an ornament to the Council Chamber, to which they lent an appearance of smartness and efficiency that is not generally perceivable there”. The minutes of the meeting record that it was to be known as the 10th (Service) Battalion, the Queen’s (Royal West Surrey) Regiment. Already 50 men had joined up and were being drilled at Latchmere baths, and recruiting had not yet begun in earnest. According to the paper, recruits were being offered a free (first class) ticket to Berlin, and the printed offers of tickets were being given out by young women in restaurants and shops “who think the local youth ought to be doing something better than making eyes over the counter”. The urge to join up had caused a rumour to circulate round the Council that staff had been told they had a fortnight to join or be discharged. Councillor Raynor, chair of the Highways Committee, said that no such statement had been made, no-one had the authority to make it and that any men who had been discharged had been due to the “exigencies of work”. The Council were also having to deal with cost-cutting measures, including the proposed closure of Latchmere Recreation Ground, Vicarage Road Recreation Ground and Christ Church Gardens from November to February. Other matters acknowledged included the new purchase of a horse for Morden Cemetery to replace the one requisitioned in October and the receipt of a case of stuffed birds by the Plough Road museum. The meeting of Wandsworth Borough Council on the evening of 16th June had to deal with what course of action to take in the event of staff being killed whilst on active service. Three deaths had been officially reported to them so far, these were listed as Private William George Daborn (2nd class clerk, Rating Department), Sergeant F Beard (store-keeper, Tooting Depot) and E Smith AB (road sweeper). Sergeant Frederick Beard was with the 24th County of London Regiment, Private Daborn with the 23rd County of London Regiment and E Smith was an Able Seaman. With a name like Smith it’s obviously difficult to find more information about him, but he may well have been this man as the date of his death fits. The Council decided that on the notification of each death they would pass a resolution of Condolence to the families and appreciation of the service of the men. It was also decided that dependants of employees killed whilst on active service would continue to receive allowances from the Council for 26 weeks. Advice received from the Local Government Board and discussed at the meeting was that the Council should avoid appointing new members of staff whilst the war was ongoing. Instead they should try to re-employ retired staff, or those who weren’t eligible to join the Army. The meeting noted that Wandsworth Council was already doing this, and further recommended that heads of departments should be given the authority to fill vacancies by hiring women. 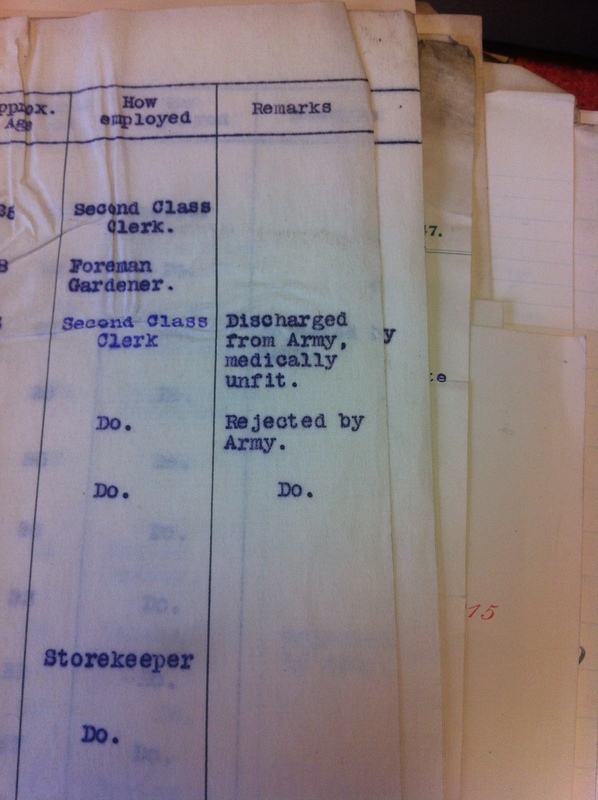 Concerns over how to fill vacancies presumably tied in to the fact that the Council was very much encouraging local recruitment, the battalion correspondence file contains a list – produced on 21st June – of staff in the Borough Engineer’s department who were apparently eligible for military service. 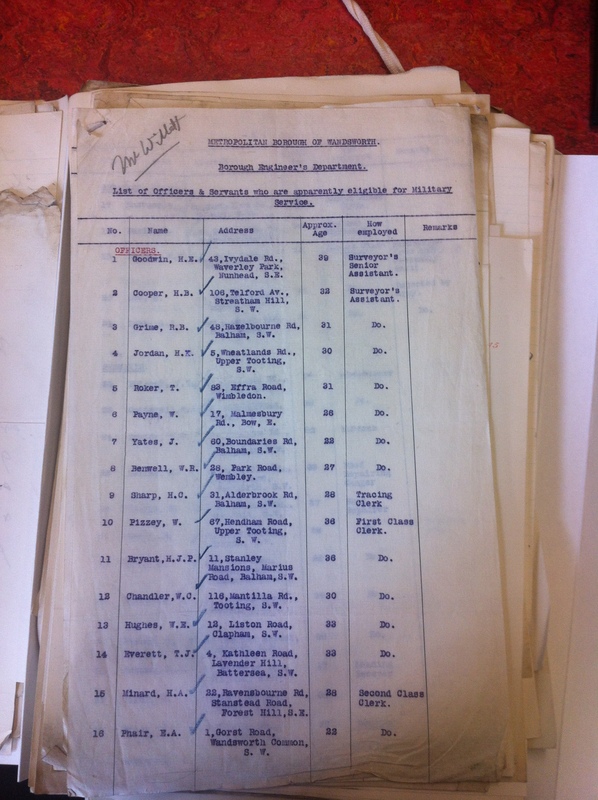 One hundred members of staff were listed, with approximate age and how they were employed, with notes including whether or not they had already been rejected for military service or not – see the images below. 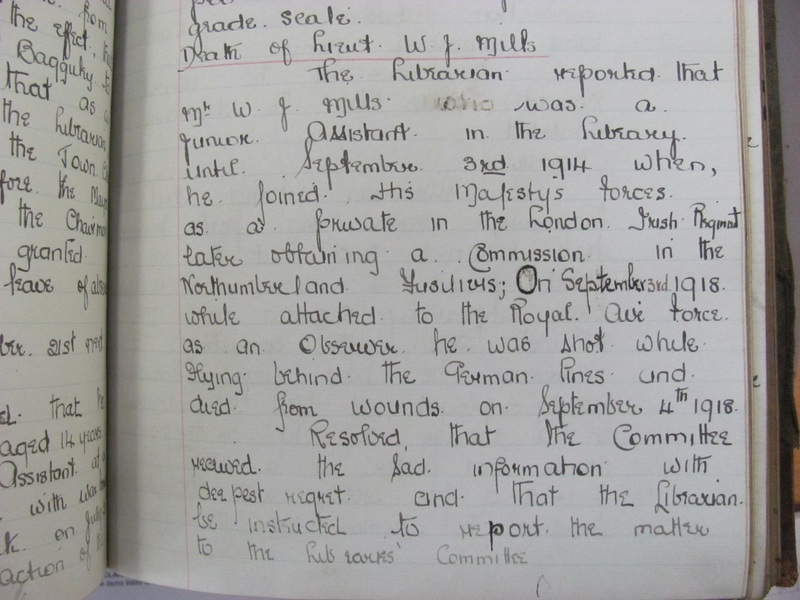 Elsewhere in the borough, an entry in the school log book for Putney St Mary’s school on 15th June records that Frank Jefcoate, a student teacher who had been absent at teacher training college, would not be returning to school as he had recently gained a commission. Jefcoate later transferred to the Royal Air Force and was killed in a flying accident in Egypt in February 1919 (the log book also records this), having been mentioned in Dispatches and awarded an MBE. Earlier this year Putney Library ran a series of behind-the-scenes tours in response to a request from our Friends’ group. In preparation for these I visited Wandsworth Heritage Service, hoping to draw on the wealth of archive material there to add a historical dimension to the tours. 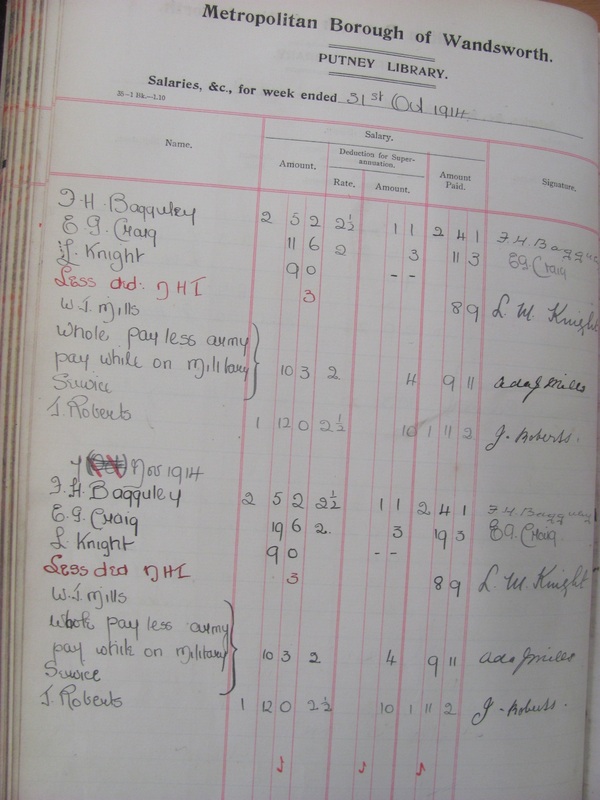 It was a chance sighting in one of the archive items – the library’s salaries book for the 1910s – which set me on the trail of William John Mills. Death of Lieut W J Mills, Northumberland Fusiliers, attached RAF on 3rd September, former junior assistant Putney Library – shot while flying on Western Front. He was born on 6th October 1894, the eldest son of John and Ada Mills. In 1914 the family was living at 59 Mexfield Road, East Putney . On 3rd September 1914, just a month after the outbreak of war, William enlisted as a rifleman – service no. 2648 – in the18th Battalion, London Regiment (London Irish Rifles). A territorial force, his unit was garrisoned in the UK throughout 1914 & 1915, but in April 1916 they embarked to Le Havre to join the British Expeditionary Force in France. William’s casualty record reports that in May he was hospitalised with measles. Then, on 28th June he was wounded in action: a gunshot wound to the forehead, but he recovered to return to his unit on 16th July. On 28th October he was promoted to Lance Corporal, and just weeks later, in December 1916, he returned from France to take up place at officer cadet school (at Fermoy in Ireland), which led on 26th April 1917 to his appointment as Temporary 2nd Lieutenant with 20th Bn. Northumberland Fusiliers (1st Tyneside Scottish) . As an officer, his service pay now exceeded his former council wage, hence the cancelled entry in the salaries book. 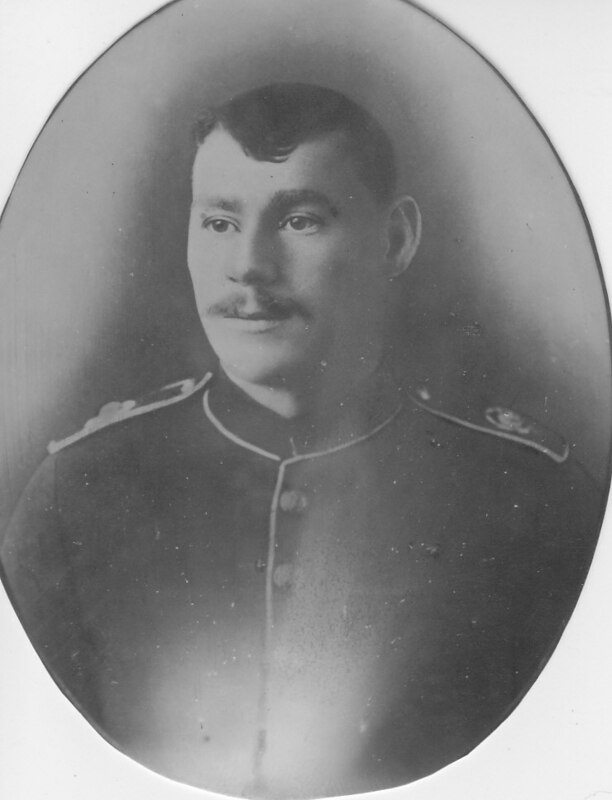 assistant in the Library until September 3rd 1914 when he joined His Majesty’s forces as a private in the London Irish Regiment [sic] later obtaining a commission in the Northumberland Fusiliers. On September 3rd 1918 while attached to the Royal Air Force as an observer he was shot while flying behind the German lines and died from wounds on September 4th 1918. This in turn led to the Council minute noted earlier. Mills is buried at the British military cemetery at Esquelbecq in northern France . The Mills family remained in Mexfield Road: the electoral register lists Ada at the address until 1947. William’s youngest brother Frank appears in the last register before the outbreak of war in 1939 but does not return afterwards, although Ancestry  records that he died in 1995 at the age of 93. 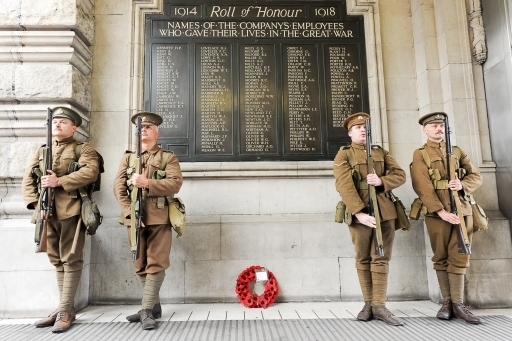 In 1923 the Library Association commissioned a roll of honour in memory of the British librarians – over 80 in all – lost during the Great War. This memorial is now located at the British Library, as are a number of photographs of those recorded on it, including William Mills . The 1911 Census records that the Mills family then lived at an address in Stanbridge Road. Army List, December 1917, 944f. http://www.cwgc.org/find-war-dead/casualty/25340/MILLS,%20WILLIAM%20JOHN A photograph of the gravestone can be viewed at http://twgpp.org/information.php?id=3064762 Puzzlingly, both sites list his unit as 20 Squadron RAF although his service record clearly shows 10 Squadron.